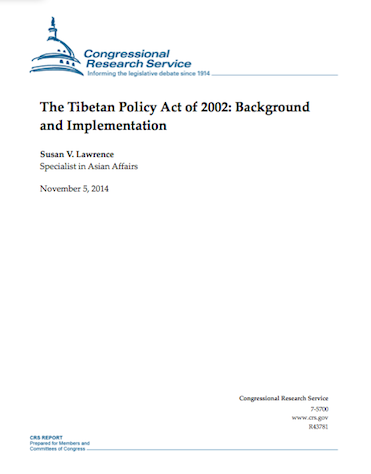 While the Special Coordinator coordinates Tibet-related U.S. government programs, congressional mandates and earmarked appropriations for most such programs are contained in legislation other than the TPA. The programs include assistance for nongovernmental organizations to work in Tibetan communities in China; an educational and cultural exchange program with “the people of Tibet”; Voice of America and Radio Free Asia Tibetan-language broadcasting into Tibet; assistance for Tibetan refugees in South Asia; a scholarship program for Tibetans outside Tibet; and National Endowment for Democracy programs relating to Tibet. Congress has shown a strong interest in Tibet since the 1980s, passing dozens of laws and resolutions related to Tibet, speaking out about conditions in Tibet, and welcoming visits by the Dalai Lama and, more recently, the political head of the India-based Central Tibetan Administration. Such actions have long been a source of friction in the U.S.-China relationship. China charges that they amount to support for challenges to Chinese rule in Tibet. Since passage of the TPA, three bills seeking to update it have passed the House of Representatives. In the 113th Congress, H.R. 4194, the House-passed Government Reports Elimination Act of 2014, would eliminate a report required by the TPA: the provision was removed in the Senate-passed bill. H.R. 2410 in the 111th Congress and H.R. 2601 in the 109th Congress both included substantial revisions to the TPA, but the Senate did not act on either bill. • To what degree, if any, should policy toward Tibet be considered in the context of relations with China? • Should Congress clarify its position on Tibet’s political status? In the early 1990s, Congress passed legislation declaring Tibet to be an “occupied country,” but subsequent legislation has often implied congressional acceptance of a status for Tibet as part of China. • What should be the balance between U.S. programs, activities, and policies focused on the six million Tibetans living under Chinese Communist Party rule and those focused on the approximately 130,000-strong Tibetan diaspora? • With dialogue between the Chinese government and the Dalai Lama’s representatives stalled since January 2010, should the TPA continue to define promotion of such dialogue as the Special Coordinator’s “central objective”?